Canberra developer Geocon will convert the historic West Block buildings in front of new Parliament House into a luxury heritage hotel after buying the site for $6.25 million from the Commonwealth. Geocon Managing Director Nick Georgalis said his company was one of the few developers in Australia with the capability and credentials to undertake a sympathetic adaptive re-use of West Block. “The new hotel will celebrate the heritage aspects of the buildings, inside and out, and, for the first time, open up these historic structures to the public,” Mr Georgalis said. Geocon said world-renowned architects Fender Katsalidis, the creative powerhouse behind Hobart’s MONA and Canberra’s NewActon precinct, would design the new hotel. West Block was designed by John Smith Murdoch and Geocon said Fender Katsalidis were the only living architects to have converted a John Smith Murdoch building into a hotel, through their work reimagining the former Acton House into The Diamant Hotel, NewActon (now Peppers Gallery Hotel). West Block was one of the earliest buildings erected in the Parliamentary Triangle of the new Federal Capital. 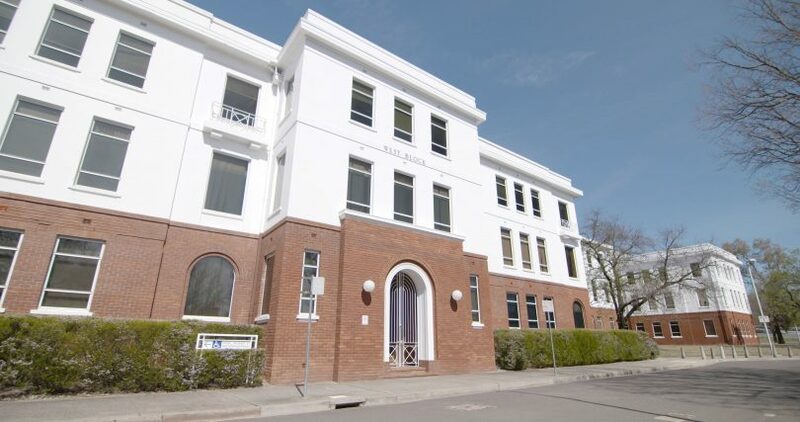 It opened for government use in 1927 as part of the Secretariat buildings and was once home to the National Library, the Crown Solicitor’s office and the Australian Electoral Commission. It is currently vacant. Part of the site, known as The Dugout, was a World War II bomb shelter, which was used to code and decode messages between Australian Prime Minister John Curtin and British Prime Minister Winston Churchill. “We haven’t been inside The Dugout yet, and we can’t wait to get in there to see what sort of amazing atmosphere it has, potentially for a bar or other purpose that embraces and shares its historic features with visitors,” Mr Georgalis said. Mr Georgalis said Geocon had already successfully re-purposed Juliana House, a 1970s government office block in Woden, into Australia’s first green star-rated hotel, and an award-winning sustainability project. Geocon owns and operates the Abode Group of hotels. The company said West Block would be one of the first of the new ‘deluxe’ offerings the group would bring to Canberra. ACT Liberal Senator Zed Seselja welcomed the sale, saying it was part of the Government’s ongoing efforts to ensure the Commonwealth’s property portfolio is appropriate for expected future needs and maximises value for taxpayers. He said the Government continued to progress sale processes for the Anzac Park East, Anzac Park West and East Block buildings. Heritage values would be protected through covenants and provisions included in the Sales Contracts and Crown Leases. “This is a great outcome for Canberra. Opportunities to revitalise the Parliamentary Triangle should be embraced.” Senator Seselja said. I’m glad about this development. Canberra has very few upmarket hotels/motels and this one in the Parliamentary Triangle is long overdue. I remember when we moved back to Canberra in 1970 the Hotel Canberra on Commonwealth Ave. A few years later the federal government put public servants in there, it was apparently purchased by the Whitlam government. I remember thinking that it was such a shame it had come to that. A grand part of Canberra’s heritage being misused in this way. Years later another government moved the public servants out, it was sold, restored as a hotel and is now one of the jewels in the Canberra crown. West Block is one of those heritage buildings that has also been misused over the years and never reached its full potential. Now there is hope that it will finally be a good, functional building for both locals and tourists. A nice restaurant where we can go for Christmas lunch, a classy hotel where tourists can stay and inject funds into the local tourism sector. Other buildings mentioned in the article could also be transformed in this way. When I was in Army I worked in Anzac Park West and looked across the road at the former BMR building lying vacant and thinking how good it would be to open it up to the public in some way. 27 years later it looks like that may happen. This is part of Canberra’s evolution from being the big country town of the 1970s and ’80s into a truly international capital city.